Here is one more scholarship in Kenya that LifeNets granted in the past month. This is for Samuel Kairu Kariuki of Matuu. 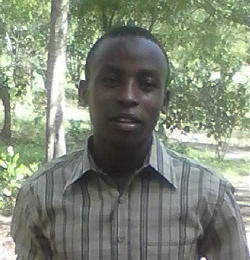 Samuel wishes to obtain skills in teaching. He will attend Pwani University in Kilifi, Kenya on the coast of the Indian Ocean just north of Mombasa. He will pursue a four-year degree as bachelor of education with emphasis on mathematics and geography. His goal after graduation is to be engaged in community development. Further to my application to be considered with sponsorship to further my education, I sincerely write to thank you from bottom of my heart for this very important deed. Through the help I got from you,I am able to pursue university education which is an important thing. I never imagined it would happen in my life. There is nothing I can do to show the appreciation other than to work very hard through prayers and dedication to excell in my studies. Kindly receive best regards from my mother and the entire family who were very happy for the sponsorship. My mom was more appreciative because that burden was taken off her shoulder and she was quite grateful.